“To prosper over time, every company must not only deliver financial performance but also show how it makes a positive contribution to society. Companies must benefit all of their stakeholders, including shareholders, employees, customers, and the communities in which they operate,” writes Larry Fink, CEO at BlackRock, talking about how corporate sustainability can contribute to a company’s longevity strategy. In fact, 62% of executives support Fink’s idea and believe that sustainability initiatives serve as a company’s competitive advantage today as well as in the future. Today, we want to talk about the L&D use case of how corporate sustainability initiatives can benefit businesses and also share our own experience relating to the development of sustainability consciousness. Well-known companies like Nike, Coca-Cola, IKEA, Siemens, and Nestlé have been supporters of corporate sustainability for quite a long time since they know how rewarding it is in terms of raising profits and enhancing business culture. Let’s take a closer look at what benefits solid corporate sustainability initiatives can bring. Improve productivity. The UCLA study shows that employees at environmentally-sustainable organizations are 16% more productive as they are more involved in the business’s vision and mission. Increase savings. The McKinsey survey states that 33% of executives say that by going green in their companies, they’ve reduced the costs of energy, raw materials, and improved operational efficiency. Strengthen the reputation of a company. Caring about the environment can improve reputation, and 32% of CEOs strongly agree. Moreover, sustainable and environmentally friendly companies outperform their competitors by 120%, improving corporate brand competitiveness this way. Drive business value creation. Value creation is a starting point for all companies and is built through work, actions, companies’ missions and visions, objectives, products, etc. As a result, 31% of businesses take on sustainability initiatives to support their goals, mission, and values. Open new growth opportunities. Corporate sustainability initiatives give companies an edge over new markets, as 27% of executives say. Reduce business disruptions. Upon dealing with sustainability issues that can arise from climate change, resource scarcity, or community issues, companies can reduce and better manage business risks. Retain and attract talent. When businesses strive to make a meaningful difference in the world, employees are eager to help. “This sense of purpose and our Sustainable Living Plan attracts and retains talent. We are LinkedIn’s top 3 most sought-after employers globally, and 50% of graduates cite our sustainability credentials as the main reason for wishing to join us,” says a representative from Unilever. The recent McKinsey Global Survey summarizes the opportunities businesses can get while taking on corporate sustainability as well as highlighting the top reasons for doing so. Of course, goals and benefits will differ for every company, however, there are three key areas that can be driven by sustainability initiatives in the workplace. 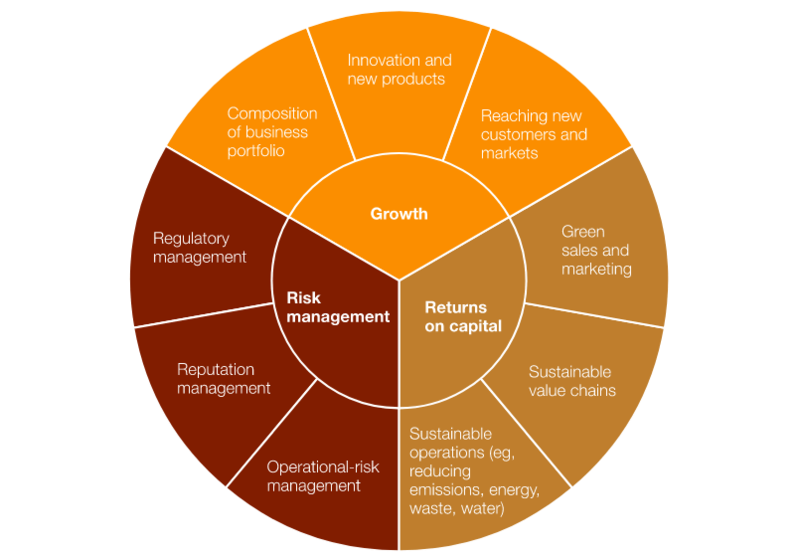 Companies can capture value in three key areas through sustainability. – The business of sustainability: McKinsey Global Survey. For all the above reasons, Rallyware has been helping companies develop and implement sustainability engagement programs that rally people and drive participation for measurable positive social impact. Children are the ones who will shape the way we live. To ensure that future business leaders will support sustainability initiatives and change the world for the better, it’s crucial to educate them on social and environmental issues from a young age. We know from psychology and pedagogy that learning should be engaging, authentic, and experiential to bring results. This is why Samsung and Rallyware created a high-tech, gamified program on environmental education called Climate Superstars. “Climate Superstars provides pre-teens and teens access to information that will equip them with the knowledge to take direct action to protect the planet, and also empower them as stewards of global sustainability to share what they have learned with peers, family and the communities where they live,” as representatives from Samsung explain the gist of this sustainability initiative. A successful fourth launch of this program has taken place in September 2018 and is continuing apace now, rallying teens and pre-teens from Boys & Girls Clubs of America. Climate Superstars is comprised of several rounds, each of which consists of various tasks, powered by gamification elements for better engagement. As clubs keep completing tasks and earning points, they unlock various fun achievement badges and move up the leaderboard. To ensure seamless communication and easy knowledge sharing between program participants, we have introduced a wide range of collaboration tools that create an experience similar to the one we have on social networks along with carefully designed tasks and activities aimed at educating kids on environmental sustainability issues and finding ways to solve them. “Just one kid can make a change,” says Darryll Roberts, advisor to the Westfield Boys & Girls Club’s Torch Club. Imagine what positive changes can bring a group of kids who now get a better understanding of the importance of environmental responsibility and what it means to be good global citizens, as Ann Woo, Senior Director of Corporate Citizenship at Samsung, says. In 2016, the impact of the Climate Superstars Program on the future generations was recognized, and Samsung was awarded the ENERGY STAR Partner of the Year for motivating young people to take actions that help protect the environment and raise awareness about climate change. By providing an engagement platform with a suite of customized sustainability programs for Samsung, together with BGCA, we are making it possible to see firsthand the impact each of us makes on the environment and learn how environmentally conscious groups of people can help the world. Rallyware’s learning and engagement platform caters to all: from youths who are becoming engaged in making life on the planet better to employees who are getting involved in sustainability initiatives to ensure business growth and build a strong workplace culture. Subscribe to the Rallyware blog below to learn the best practices of implementing corporate citizenship programs and driving long-term business success through sustainable business growth!